SeaWays Global is delighted to be using the facilities available at the Transas Academy. 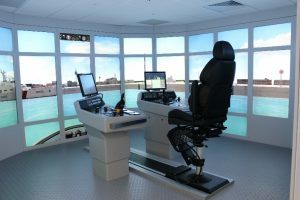 This world-class training centre is located at the Lakeside North Harbour in Portsmouth and boasts first class equipment, installed with the latest software, leading edge technologies and highly realistic simulator visualisation. Simulation briefing rooms, where preparation and debriefing of all exercises is carried out. All simulators are the latest generation of the Transas Navi-Trainer Professional 5000 (NTPro 5000). They feature realistic ship consoles with a complete set of dedicated hardware controls and displays that address all key bridge functions. Genuine Damen hardware winch controls. Hydrodynamic modelling accurately replicates the dynamic interaction between ship and tug. 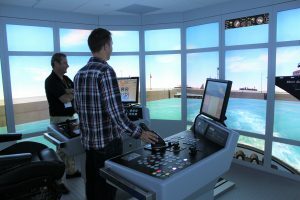 The high quality of simulation underpins Global’s ability to demonstrate and train 55 separate aspects of tug operations. 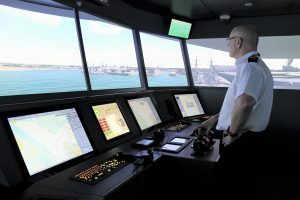 In addition to the tug training courses, SeaWays Global provides an ‘Effective use of tugs for Maritime Pilots’ course, using the Full Mission Bridge Simulator; this has been designed specifically to meet the needs of pilots mindful of the constantly changing design of tugs, their operation and capabilities. This course has already been successfully delivered to over 400 maritime pilots worldwide.